Sure I knew my fair share about the modern game and players that have starred in the league since the mid-90’s. But there’s so much more than that. No place could ever make that more apparent (save Canton, OH) than NFL Films. I knew names like Al Davis, Tom Landry, Hank Stram, Norm Van Brocklin, and John Mackey. But I didn’t know their true significance. Then when Davis passed away, I was assigned by a producer of “Inside the NFL” to find old footage of him from the Films library, as well as clips from shows like “The History of the AFL” to post on our blog during Al Davis tribute week. I’m too young to remember Al Davis’ contributions to the league and knew him mostly as a grumpy, stubborn owner. But when I actually did research on him, I realized that without him, this league might not have ever happened. 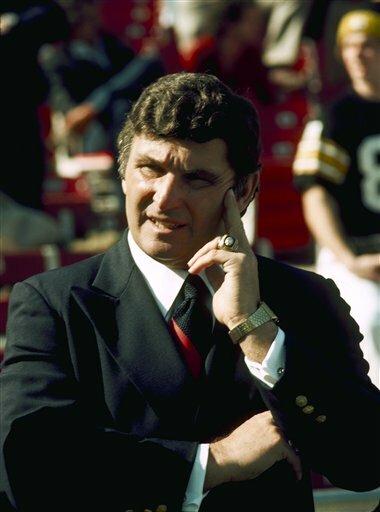 I realized that he was so football savvy that he could successfully coach, manage, and own an NFL franchise – he was the ultimate leader. He was charismatic, fan-friendly, and had the respect of his players and coaches. And that maybe the finalization of a merger deal done behind his back by fellow AFL owners was the root cause of some bitterness. Never did I look for Al Davis’ side of the story until I came here and had the resources to do so. For the longest time I only knew one of his coaches, John Madden, as the name of a video game. I vaguely knew he coached the Raiders to a Super Bowl back in the day, but that’s about it. 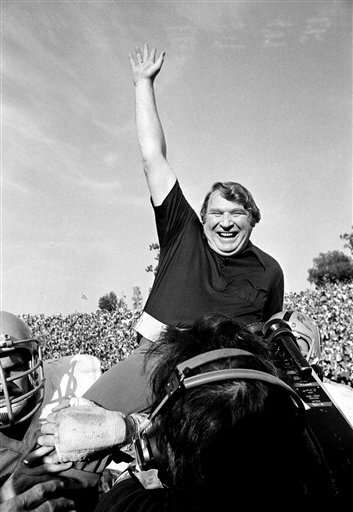 I didn’t know as much about the Raiders’ struggles with the Steelers, or how Madden ‘couldn’t win the big one.’ I found that he finally did, which gave us that indelible image of him being carried off the field with a smile from ear-to-ear and his arm raised in the air. Oakland has been somewhat irrelevant since I’ve been alive, but working here has opened my eyes to all the history that makes this league great, and the Raiders are a huge part of that history. Everyone here knows everything about the National Football League and I’m just doing my best to catch up. Now what used to be just names, have become ‘the man with the funny hat’, the first head coach mic’d during a Super Bowl, an old Dutch quarterback who still holds the record for passing yards in a game, and a Colts tight end whose highlights are as amazing as any in the modern game. Just wondering what will blow my mind next.